I happened on a Peterson-branded 3-in-1 pipe tool a few months ago and sent it to my Dad, who said he loved it: the heft, the utility, the design. I’d been using my Gratis with Peterson’s Patent System Pipes 3-in-1 for several years and couldn’t see how the new one could beat it. I forgot about the new one until Kerry at the Black Swann sent me one with a Peterson I’d ordered. I took the new tool with me to the Chicagoland Show, not wanting to risk my old Gratis tool and found myself falling in love with it for just the reasons my Dad enumerated. That pipe tool has been around for a number of years—I’m going to say at least fifteen. There is no difference between the one that is branded Peterson and the plain one without any branding – There have been a number of occasions when the tools arrived to us without the branding when we asked for it to be branded (! ), and as it’s sourced in the Far East, it’s simply not worth our while sending them back. In fact, the specific shape of pipe tool isn’t unique to Peterson and I believe there are others using it. We use them primarily for promotional purposes (such as with a high-grade pipe) but they are also available for sale with any distributor and in turn retailers. The problem is that there are plenty of varieties and options on pipe tools and more often than not its some locally-sourced tool that people go for on account of cost. Now as long as there have been pipes, there have been tampers. If you haven’t used your finger as a tamp, you probably haven’t smoked more than a bowl or two, because along about the second or third burned finger, you learned to keep a tamper handy. By the mid-19th century, well before briar became the norm, smokers seemed to have arrived at a consensus that there’s three basic operations that may need to be done while smoking one’s pipe: (1) the aforesaid “stopping” or “tamping,” (2) clearing clogs from the draft hole with some kind of pick and (3) unloading smoked or unsmoked tobacco from the chamber. Charles Peterson, who was not only a great inventor and carver but a guy who smoked like a freight train, knew from the get-go that his pipes, and particularly his Patent System, needed to be clean to function correctly. Accordingly, K&P provided tutorials in both their 1896 and 1906 catalogs. But realizing that charity consists more in actions than good advice, the company followed up by providing every single Patent pipe they made with a “Gratis with Peterson’s Patent System Pipes” 3-in-1 pipe tool, and did so until sometime in the early 1960s. As those who frequent the Peterson listings on eBay have probably noticed, these tools keep turning up, most in remarkably good condition, usually stamped BRITISH MADE, but once in awhile (as seen above) with a MADE IN GERMANY around the ring. From K&P’s end, after “The Thinking Man” icon and logo, it was undoubtedly the best advertising they ever did: every time a pipeman picked up the Gratis tool, he remembered his System pipe. The Gratis pipe tool is known these days as a “Czech Tool,” because all the good ones say MADE IN over CZECH REPUBLIC on the tamp stem (and representing fully 1/3 of that nation’s export economy, I am told by unreliable sources). But as my eye strayed from my Gratis Tool to my Czech Tool, the thought finally occurred to me that maybe the Czech Tool really ought to be called a Gratis Tool, since Peterson’ version dates all the way back to the 1896 catalog. Now I’d like to be able to say that Charles Peterson invented the thing, but as it turns out, the 3-in-1 had been around for a good while before the System pipe. 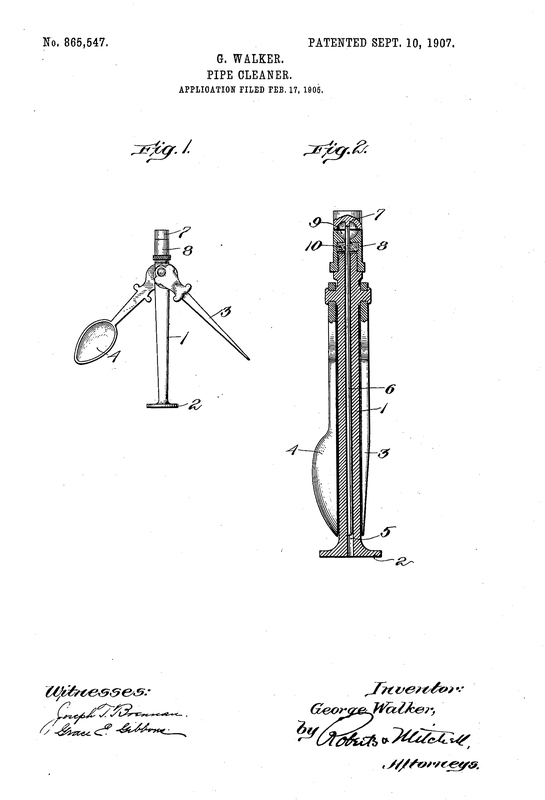 One of the first patents I traced for a 3-in-1 was by Gustavus Matile, and dates from 1864. In his patent letter he writes that “it is well known that devices of similar kind have been used long since by smokers; but they were not so complete as mine, and they lacked the spring, which constitutes the essential part of my improvements.” He may have learned about the spring from the Aubrac folding knives of France, which had been around for thirty years by the time of his patent. 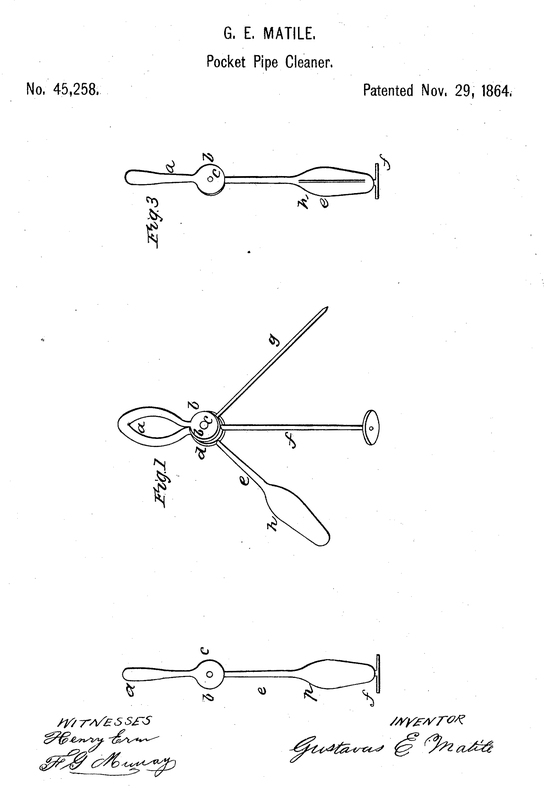 I found another 3-in-1 pipe tool patent from George Walker, of Newton, Massachusetts, filed in 1905. Like Miller before him, he states that the three parts of the tool “are well known to pipe-smokers,” his patent covering a fourth tool, a flexible cleaning rod concealed in the bore of the tamp (#6). One of the great gurus of the hobby in recent years has been Fred Hanna, and if you haven’t read his deliciously satirical essay on “The Hidden Benefits of the Expensive Pipe Tamper,” I suggest you immediately do so. You can find it in his book The Perfect Smoke (2012), or at the TobaccoDays blog at http://tobaccodays.com/2015/07/the-hidden-benefits-of-the-expensive-pipe-tamper-by-fred-hanna/ . Hanna seems to be able to get along with just the tamper, with no need of either pick or spoon. There will be those who suspect he wasn’t brought up with tools or say he doesn’t go in for the manly D-I-Y aspects of the hobby. But they’re wrong. It’s because he is a kind of Jedi Knight of the pipe-smoking world and never has clogged airholes, never packs his pipes too tightly, and certainly never finds his straight-grain artisan pipe’s chamber with ash clogging the unsmoked tobacco beneath. If you’ve looked at all at the expensive tamp market, you’ll notice there is what I would call a “double-function” tamp, made rather like a sword-stick, with a tamp and a screw-out poker. And you might think that Hanna occasionally sneaks out the poker to unclog the draft hole. Fie! Not likely. While anyone who’s encountered the frustration of a clogged draft-hole knows the value of the poker, only army-mount and System users have the ability to actually remove the mouthpiece during smoking and unclog the draft. All others—that is, most of the smoking world—have to set down their traditional mortise-and-tenon “navy mount” pipe until it cools and go pack another pipe, perhaps more carefully this time. I, on the other end of the world from Mr. Hanna, am one of those poor sods who often enough packs his tobacco too tightly, and so must sometimes scoop it all out and begin again, or through some malignant agency find the airhole clogged and unable to draw about midway through an otherwise perfectly idyllic smoke. I couldn’t live without the poker. At the Chicago show, my co-author Gary Malmberg taught me a trick with the poker that I’m sure everyone in the hobby knows but me, but in case there’s just one guy who doesn’t know it, allow me to share it here. (Everyone else just take a breath and skip over the next paragraph.) This tip is for those who routinely smoke their bowl of tobacco down to the bottom, not for those who smoke the top third or half, then set down the pipe and are done with it, or empty out the dottle to smoke another day, Sherlock Holmes-fashion. When I get about 3/4ths the way through my smoke, it inevitably happens that I tamp the surface, but can’t get a good relight. I poke my finger down and can tell I’ve still got a quarter of a bowl or more left, then try another three or four relights. When Gary saw me doing this, being the wise man he is, said, “That’s one of the reasons you’ve got a pick in the 3-in-1 tool: take the pick and gently poke two or three air holes down through the layer of ash and the tobacco beneath to the bottom of the bowl, being careful not to push the pick into the chamber floor.” Well, I tried it, and presto, as they say. Problem solved. Merrily I smoke along, until I’ve smoked the bowl to the bottom. I think Charles Peterson liked the 3-in-1 because he knew that sometime, someplace, it was going to be needed. I don’t know if he was a boy scout back home in Riga, Latvia, but you get a sense that “Be Prepared” was not an unfamiliar notion to him. One could wish the tradition hadn’t ended in the early 1960s, and Peterson Systems were still packaged with this fine old tool. 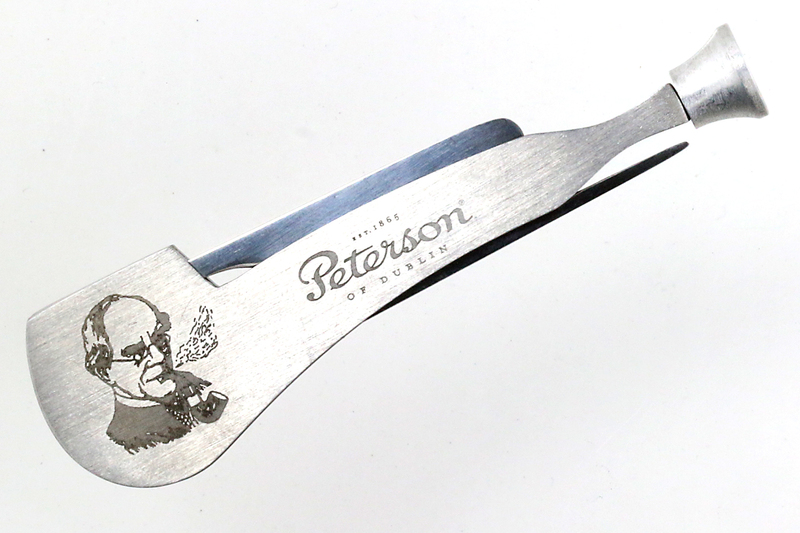 I’ve suggested as much to Peterson—and how cool would it be if it were made in Ireland rather than the far East? But for all that, Peterson’s more recent branded version of the 3-in-1 is actually a step above the old one, even if it is almost as hard to come by. There’s a few places in Europe that sell them, and a few that offer them as a promotional gift with the purchase of a high-grade Pete. The tamper base is a good size, the pick is longer than the old Gratis tool (a good thing), and the reamer serves just as well as the Gratis shovel / spoon with the additional bonus of the slight serration for lightly reaming unwanted carbon. The stainless-steel sides, which accidentally resemble the 406 and 408 catalog shapes, give the whole thing a decent heft. They also give your fingers something to hold onto while tamping, which neither the old Gratis tool nor most of the expensive tamps I’ve seen do. It’s not inexpensive (about $180 if you can find one), but the craftsmanship is impeccable, the beauty is beyond compare. Like a classic Peterson pipe, it’s got loads of history behind it, including the story of the bee engraved on it as well as the shepherd’s cross (see the little dot-thingies in the shape of a cross in the handle? ), which I won’t spoil for you. You can find out more about the remarkable history and production of these knives in a video at https://www.youtube.com/watch?v=pvnKaFFA8qc. and to Smokingpipes for the photo of the Laguiole Calumet. 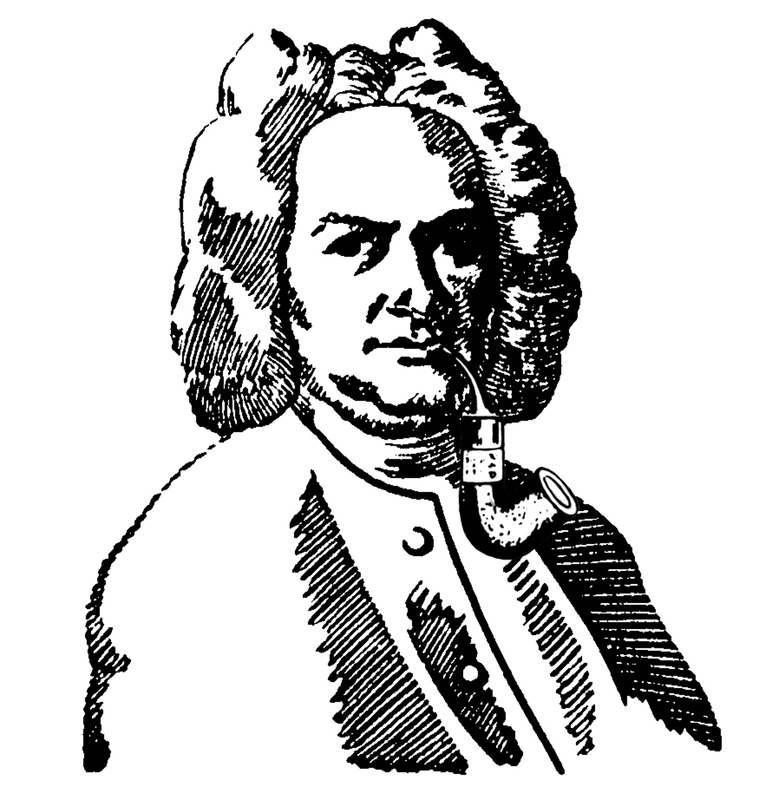 * From “Edifying Thoughts of a Tobacco Smoker,” by J. S. Bach, in Hans T. David and Arthur Mendel, The Bach Reader, rev. ed. (1966), pp. 97-98. At one time in March I had six of those beside the one in use. I gave them away at a club meeting. Now I have two. They come with pipes from England ” Free Thinking Mann pipe tool inside” labeled on the box. Yes, the UK is about the only place I see them advertised. 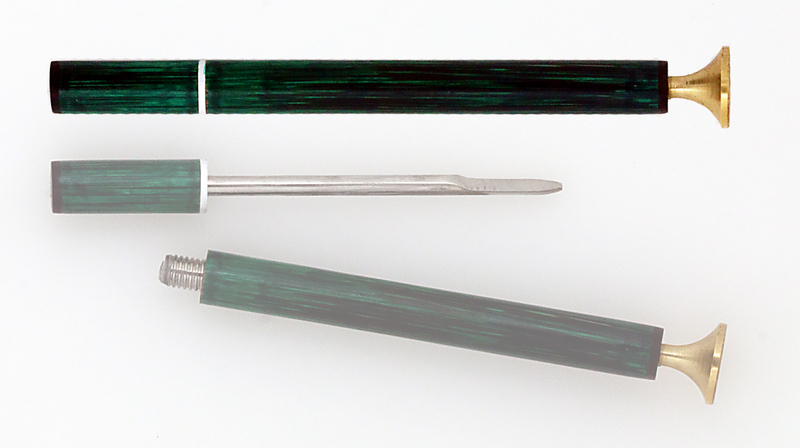 I have the Laguiole pipe tamper, is great!! You are a lucky man! 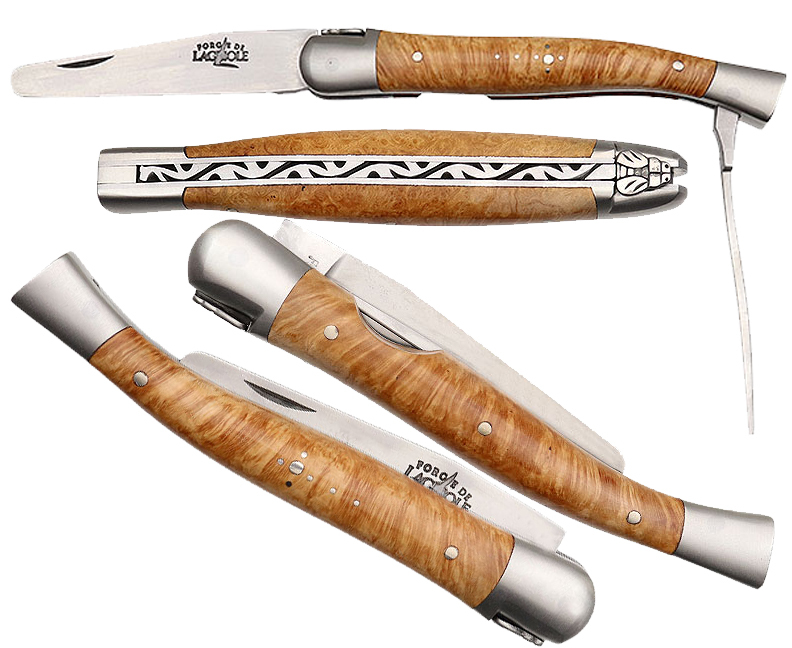 I see Bolitto Pipes got some new ones in, so maybe the Forge de Laguiole is still making these? my tamper was purchased on Al Pascià. Great information about the lowly pipe tool! I’ve always used a simple Brebbia nail, with tamp and shovel only. Gary’s comment about the pick is interesting, I’ll have to give it a try. Coincidentally, just this week I received a GBD pipe that also included a GBD branded 3-in-1 Tool of the same design. I had always discounted using this type of tool, but now I will throw that one into my bag and give it a whirl. Hope you like it. It was fascinating to me that Peterson gave these away as early as 1896. I’m wondering if any other pipe-makers had similar tools as give-aways, esp. since the basic design seems to have been around for much of the 19th c.
Great article Mark! You gave me the extra push to re-open my 11s box that I got from Kris at The Black Swan, and this time actually take a look at the tamper that was included. Once I lose my original Czech Tool that I have somehow managed to not misplace over my years of pipe smoking I will give this one a go! Kris is the best! I love the 11S–my wife gave me one for Christmas the first year we were married–well, actually it was about a week before, because she was too excited to wait. That was 1978, if you can believe it. 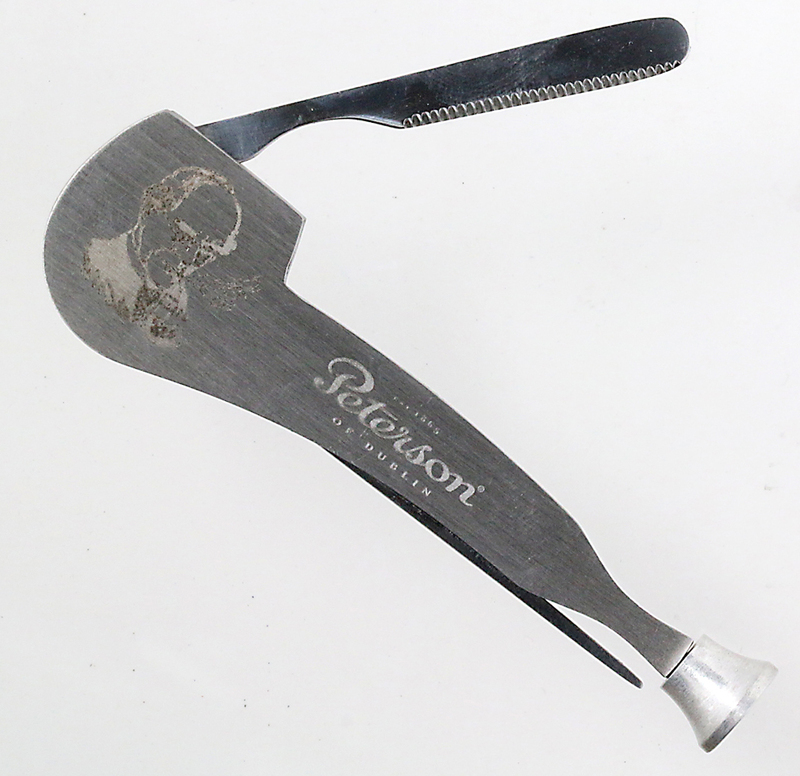 You have probably already seen it, but the Rockwell Binge Tool would be pretty close to the Leatherman/Swiss Army Knife type of tool you envision. Tamper, scoop/carbon reamer, pick, cap lifter, key ring/lanyard ring, and corkscrew. I modified mine and removed the corkscrew and fashioned and installed a brass tube cigar punch in it’s place. Wow! Never seen this one. Of course every site I find it on says OUT OF STOCK. Sigh. Your cigar punch replacement is brilliant! I don’t fire up many sticks, but that seems more realistic here in the US. France is probably another matter. I don’t smoke many cigars either, but I do prefer a punch rather than a cut…generally. The punch is more useful to me, I carry a SAK with a corkscrew as EDC (I use it for loosening knots in rope or string more than opening wine bottles). The pick on the binge tool is a little short, but it works. I received my new Peterson pipe tool with my new Writers Collection Shaw (one of my “holy grail” pipes) that I found at “My Smoke Shop” in the UK last year. Great shop. What a great shape! 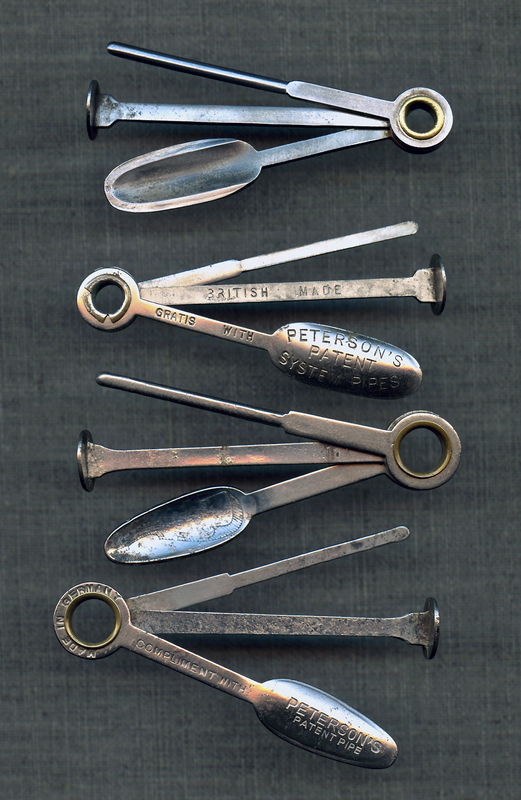 Peterson needs more bent dublins–the one before Shaw, and the ONLY one, was the original shape 05 System in the late 70s and early 80s. 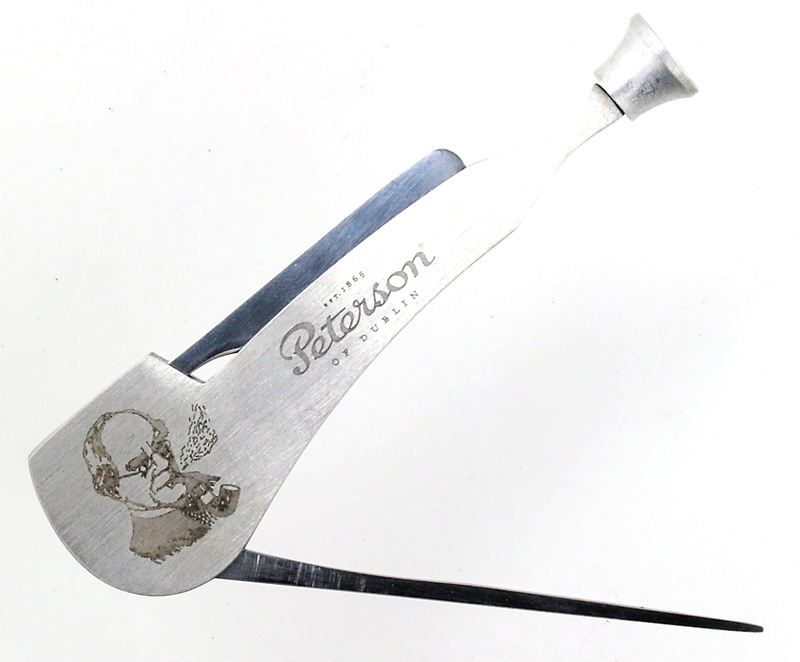 A UK tobacconist told me that the UK is the only place (he thinks) where the Peterson tools are routinely found, under the heading of “promotional.” Go figure! 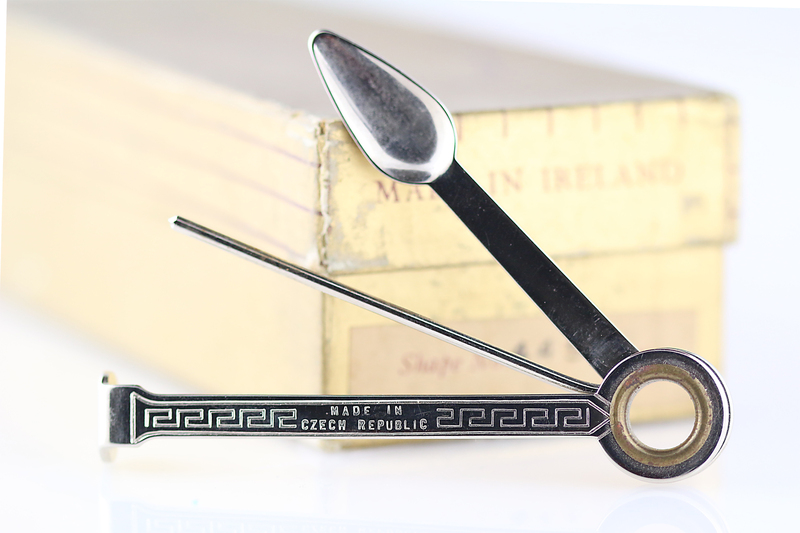 As far as bent dublins, what about the Suir River Series B30? Which I also have one of:). I also have a couple of the xl305 or 305xl. One is a System Standard Bent Dublin, the orher is a Deluxe System Calabash shape. It has the briar and silver P inlay stem logo like the 309? At the top of you pipe note page.